2018 Season Review: Can Josey Jewell or Devin White replace Brandon Marshall? Since December, the rumor mill has been churning out buzz around starting linebacker Brandon Marshall and the Broncos parting ways this offseason. Marshall has missed chunks of the 2018 and 2016 seasons thanks to injury, and in that span has been outplayed by veteran Todd Davis and occasionally even young guns Josey Jewell, and even Joe Jones. In fact, each of Davis’ last two seasons grade out higher than either of Marshall’s last two seasons on Pro Football Focus. Meanwhile, Jewell is nipping at Marshall’s heels in terms of overall grade, and he graded far better against the run and as a tackler. Jones and 2018 sixth round pick Keishawn Bierria were used sparsely, but still earned a higher grade than Marshall, too. If it weren’t for Marshall’s outlying Week 16 performance against the Raiders, which earned him a grade of 91, Marshall would have easily been the lowest-graded inside linebacker on the team. Two weeks ago, Marshall made it clear that even he’s expecting to be let go this offseason. 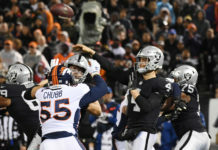 At this point, it feels more like an inevitability that the Broncos will be looking to move on from the longtime linebacker unless the two sides are able to agree on a restructuring of Marshall’s contract, something both sides have shown interest in. 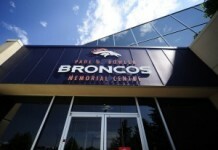 When asked about restructuring Marshall said he, “absolutely” wants to finish his career in Denver and would be open to re-negotiating, before later posting a photo outside the Broncos facility. 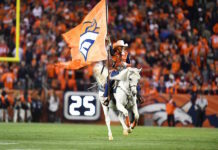 Should the Broncos restructure Marshall’s deal to keep him on board for the foreseeable future, or should they move on and attempt to develop their young linebackers behind him? The most likely alternatives at linebacker for the Broncos are probably on the roster already in Jones and Jewell, but if Vic Fangio determines those options aren’t to his liking, he could look to add a stud linebacker through free agency or the draft. Former Baltimore Ravens backer C.J. Mosley will be near the top of the Broncos’ board once free agency rolls around. The four-time, second-team All-Pro and Pro Bowler could re-sign in Baltimore, but would probably prefer to hit free agency for a much bigger payday. Mosley has been excellent against the run and pass while leading the Ravens’ dominant defensive attack. If Mosley isn’t available, the Broncos could instead target Kwon Alexander or Jordan Hicks, who wouldn’t be the worst consolation prizes. Alexander has often been the best player on Tampa Bay’s patchwork defense and has a nose for the ball that results in big plays. Hicks is less flashy but far more reliable. Hicks is the safe bet, but knowing Elway’s style, Alexander is the more probable target. The best option at linebacker for the Broncos, though, lies in the draft. 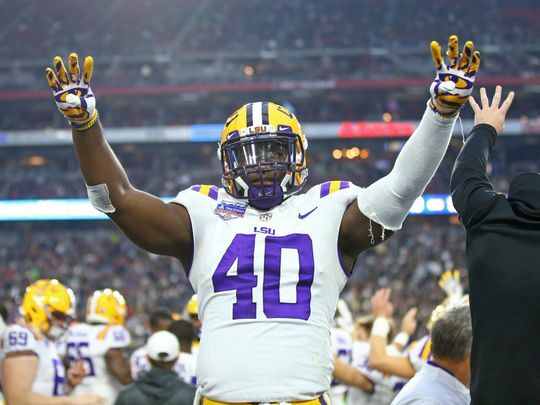 Devin White is an absolute freak of nature athletically and will be one of the best value picks in this year’s draft for whatever team picks him. The position of off-the-ball linebacker has gone the way of the safety and is no longer viewed as a premier position to invest in like edge rusher, tackle, or quarterback. So, despite White almost unanimously being viewed as a top-five player in the draft, he will likely fall. There are three quarterbacks, three edge rushers, two interior defensive linemen and an offensive lineman who should all go before him. The inverse of this value is seen at the quarterback position in prospects like Drew Lock and Daniel Jones, who wouldn’t go until the second or potentially the third round of the draft in most any other class. The flaw with White is that he is fairly raw. He only started playing the position in 2016, as LSU actually recruited him to be their replacement for Derrius Guice at running back. Instead, White ended up becoming the next Myles Jack for the Tigers. This lack of polish means that wherever White goes, he’ll need a strong linebackers coach. Good thing the Broncos just hired a man widely considered the greatest linebacking coach everto be their head coach. Vic Fangio’s presence has led SB Nation draft analyst Brett Kollmann, as well as NFL.com draft analysts Chase Goodbread and Daniel Jeremiah to peg the Broncos as the ideal landing spot for the bayou-based stud. If Elway opts to address linebacker in the draft, he has to do it in the first two rounds as there is a Royal Gorge-esque drop off between the third-best linebacker in this year’s class and the fourth. Any of the top three linebackers could go in the first round, although Mack Wilson and Devin Bush may have to wait for Day 2. Meanwhile, Tre Lamar or Bobby Okereke likely won’t go until late in the third round on the early side. As painful as it is to say, the Broncos should let Brandon Marshall walk and add either C.J. Mosley or Devin White to replace him. Mosley would replace the void of veteran leadership left by Marshall, but preferably White will be drafted as his ceiling is sky high with Fangio developing him and his price tag is much easier to swallow. Marshall has been great but is clearly on the decline, being injured two of the last three seasons. That, mixed with the top-heavy crop of linebackers available, makes it the perfect time for the Broncos to not only replace Marshall but upgrade at a position that has troubled them for years. White is also the perfect pairing next to Jewell, who excels against the run and possesses top-tier instincts, but lacks athleticism. White would make up for Jewell’s shortcomings in coverage, allowing Jewell to be the best version of himself and vice-versa. It’s hard not to love the image of a Fangio defense led by Von Miller, Bradley Chubb, Jewell and White just daring opposing offensive lines to block them.